It is surprising how much detail is already present in your baby’s body. 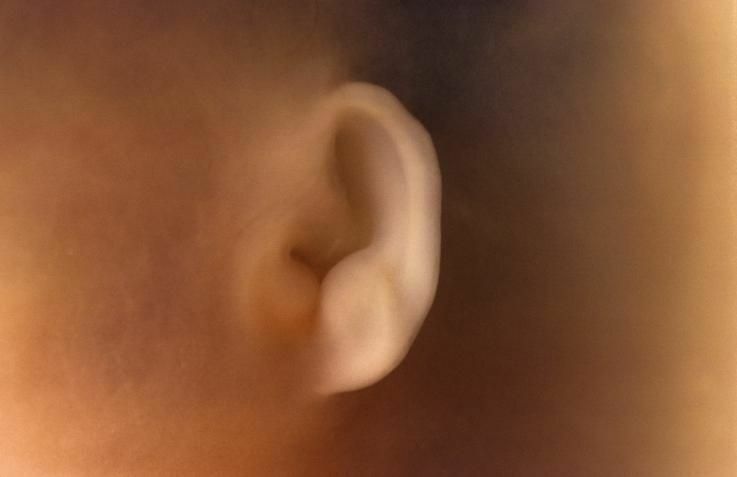 This close-up of an ear shows that its helical pattern of folds is nearly fully developed, although it is still too soon for your baby to hear anything. Your waistline will be increasing and your body shape changing but your bump is unlikely to be very prominent for several weeks. By week 14, if you stand in your underwear in front of the mirror, you will see a change in your body shape, but to the outside world you may not look very different. Women who have previously been pregnant tend to show earlier than those who are pregnant for the first time, as their stomach muscles have already been stretched once and so stretch much more quickly. Women often say that this is the time when they look as though they have put on weight and feel fat, not pregnant! But it won’t be long before your bump will be visible for the world to see. If you’re feeling uncomfortable and heavy, make sure you choose the right clothes. Aromatherapy uses essential oils extracted from plant sources. These can be effective remedies for some complaints, but not all are safe in pregnancy. Essential oils need to be diluted in carrier oil for massage, or alternatively can be added to a bath or diffused in a lamp or burner. Guidelines should always be printed on the label, so make sure you check these before use. Essential oils have not been tested on pregnant women for obvious reasons but, based on the properties they contain, the advice is to err on the side of caution and avoid those that are known to cause cramping or contractions, as well as those that thin the blood. Don’t use: basil; cedarwood; cinnamon; clary sage; cypress; clove; fennel; hyssop; jasmine; juniper; lemongrass; myrrh; parsley; pennyroyal; rosemary; sweet marjoram; thyme; peppermint. Is it safe to use complementary therapies? Complementary therapies can help with some pregnancy discomforts. If you’re seeing a practitioner, make sure that he or she is registered and experienced in treating pregnant women. “Natural” doesn’t mean “safe”; only use therapies that are known to be safe in pregnancy. Reflexology is a complementary therapy that involves applying pressure to reflexes on the hands and feet. It’s believed to help with morning sickness, backache, fluid retention, and swelling during pregnancy. no one is answering my questions?